The role of ventriculo-peritoneal (VP) shunt in the treatment of hydrocephalus is well established for several decades. It however results in several complications, the commonest among which is shunt blockage and revisions. Multiple shunt revisions can be a difficult situation to handle particularly if the shunt has been placed in all quadrants of the abdomen. We are presenting a case where a patient with congenital hydrocephalus had fourteen shunt revisions and sixteen surgeries in his life span for hydrocephalus and its sequels. He presented with features of blocked shunt. The patient was offered endoscopic third ventriculostomy (ETV) an alternative to repeated shunt revisions. A 16-year-old male child presented with history of headache, vomiting, and impaired vision for last 5 months. Headache was moderate to severe in intensity and associated with off and on vomiting. The patient also suffered an episode of generalised tonic clonic (GTC) seizure one month ago. He also had complaints of fever and swelling over right mastoid and peritubal cerebrospinal fluid (CSF) leak along the tract of VA shunt for the last 15 days. Patient was in altered sensorium with Glasgow Coma Scale (GCS) = E4 V4 M5. He had no vision in right eye whereas in left eye only hand movements could be perceived. He had bilateral papilloedema. No other neurological deficit detected. There was boggy swelling in the neck with minimal tenderness along the tract. 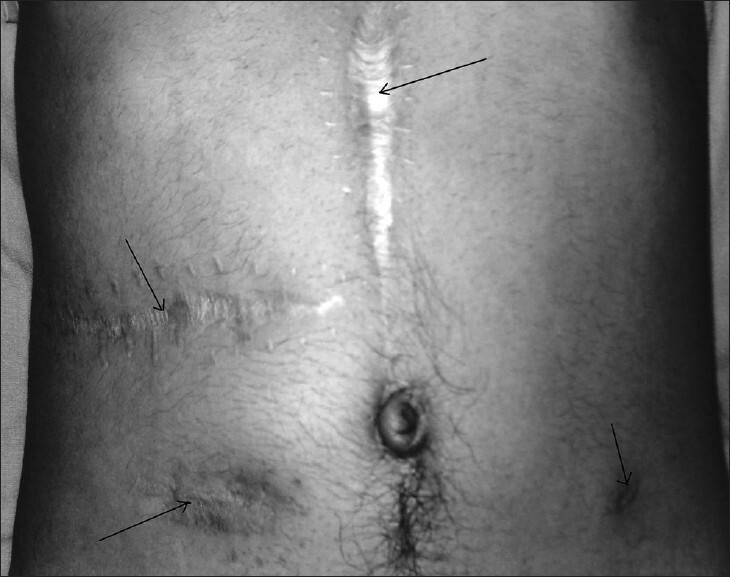 His abdomen showed several scars of previous operations [Figure 1]. Patient was operated elsewhere at the age of 7 months in the year 1987 for congenital hydrocephalus. He had presented with increasing size of the head (51.5 cm) with bulging anterior fontanelle. Right VP shunt (Chhabra; Surgiwear India) was performed, which worked well till the age of 3 years. From year 1990 to 1999, VP shunt was revised 6 times for blockage at the abdominal end. In 2000 he had 2 shunt revisions 6 months apart. In 2001 within a small duration of 5 months patient had 6 shunt revisions for shunt malfunction. In all, the shunt tube was placed in almost all quadrants of abdomen. In 2001 patient presented with headache, vomiting and intestine obstruction due to large infected intra abdominal pseudocyst. Laparotomy, adhesionolysis, and exteriorization of shunt tube were done. Later shunt tube was reinserted in suprahepatic space but it was again blocked very soon. After 15 days right ventriculo-atrial shunt was done. This VA shunt worked for nearly 9 years before patient presented to us. In all, he had sixteen operations in his life for hydrocephalus and sequel of shunt. The computed tomography (CT) scan showed marked dilatation of lateral and third ventricles with aqueductal stenosis. 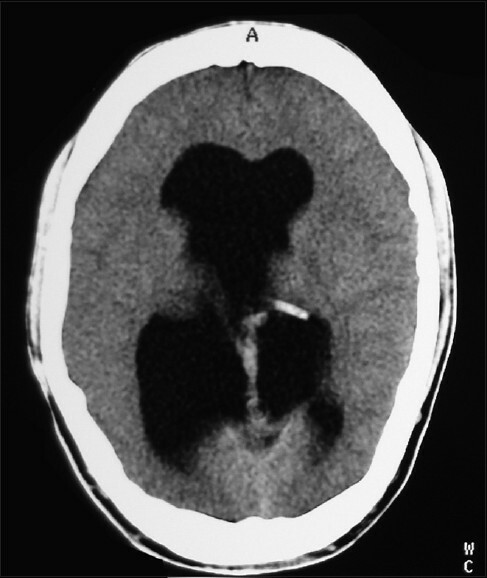 Intraventricular shunt tube was visualised within the ventricle [Figure 2]. As the patient had shunt placement at almost every part of the abdomen and VA shunt was also malfunctioning, the option of ETV was considered in him with informed consent. The ETV was performed with standard techniques in February 2010. The CSF was clear under marked pressure. There were some adhesions distal to floor of third ventricle, which were broken with Fogarty catheter. The VA shunt was removed. After ETV, there was a remarkable improvement in level of consciousness and there was some improvement in vision (6/18) in both eyes as well. Patient was able to do finger counting at a distance of 3 feet one month after the surgery. At a follow-up of six months, there were no signs of any clinical deterioration. The post op CT scan showed presence of CSF in subarachnoid spaces without a significant reduction in size of ventricles. The role of VP shunt is well established. However, repeated revisions can cause very difficult challenge to surgeon as well as to the patient. There can be situations where putting a shunt in previously operated cases in the abdomen is difficult, more so if the patient had undergone repeated shunt revisions. The alternate route of VA shunt is an option but is less popular. ETV has emerged as an important alternative to VP shunt in the treatment of all types of hydrocephalus. ,, Its role in patients with previous VP shunt surgery is being studied worldwide. There are reports of successful ETV in patients who were previously shunted with encouraging results. ,,, There would still be some reluctance to do ETV in previously shunted patients due to risk of its failure. However, the acceptance of ETV is likely to be more when repeated shunt failures have already occurred. ETV can provide shunt independent life to such group of patients, particularly the patients who had tragic experience of repeated shunt revisions as in this case. The long term follow-up of such cases would be subjected to experience of similar cases in various institutions. However, the patient and the family were very happy as another shunt revision was avoided. 1. Wu Y, Green NL, Wrensch MR, Zhao S, Gupta N. Ventriculoperitinial shunt complications in California:1990-2000. Neurosurgery 2007;61:557-62; discussion 562-3. 2. Javadpour M, Mallucci C, Brodbelt A, Golash A, May P. The impact of endoscopic third ventriculostomy on the management of newly diagnosed hydrocephalus in infants. Pediatr Neurosurg 2001;35:131-5. 3. Hopf NJ, Grunert P, Fries G, Resch KD, Perneczky A. Endoscopic third ventriculostomy: Outcome analysis of 100 consecutive procedures. Neurosurgery 1999;44:795-804. 4. Singh D, Gupta V, Goyal A, Singh H, Sinha S, Singh A, et al. Endoscopic third ventriculostomy in obstructed hydrocephalus. Neurol India 2003;51:39-42. 5. Cinalli G, Salazar C, Mallucci C, Yada JZ, Zerah M, Rose CS. The role of endoscopic third ventriculostomy in the management of shunt malfunction. Neurosurgery 1998;43:1323-9. 6. Jones RF, Stening WA, Kwok BC, Sands TM. Third ventriculostomy for shunt infections in children. Neurosurgery 1993;32:855-9; discussion 860. 7. Boschert J, Hellwig D, Krauss JK. Endoscopic. Third ventriculostomy for shunt dysfunction in occlusive hydrocephalus: Long term follow-up and review. J Neurosurg 2003;98:1032-9. 8. Hader WJ, Walker RL, Myles ST, Hamilton M. Complications of endoscopic third ventriculostomy in previously shunted patients. Neurosurgery 2008;63 Suppl 1:ONS168-74; discussion ONS174-5.